2, 4, and 8-pole Cable and Chassis Connectors in Various Versions. For cable assembly instructions, click here. countersunk thru holes, 3/16" flat tabs. links two NL2/4FCs together for cable extension. Can be permanently attached to NL2/4FC. The new STX Series is the next generation of Speakon® connectors especially designed for heavy duty amplifier-loudspeaker applications like professional tour sound. The extremely rugged and durable STX Series feature an all metal housing and metal reinforced latch lock system. This series of professional speaker and amplifier connectors is recognized as the industry standard. The SpeakOn® product line now comes in 2, 4 and 8 contact versions. Patent protected, reliable, cost effective and extremely durable the SpeakOn® system offers the "quick lock" locking system and recently redesigned inserts on it's cable ends. 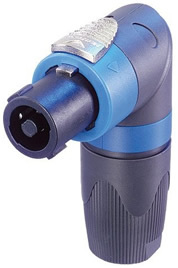 The inserts feature solderless connections using screw type terminals with a captivated pressure plate. No special tools are required making these connectors 100% field repairable. A two-conductor cable for each channel with NL4FC on both ends NL4MP pin+ to speaker coil "+"
NL4MP pins 1- and 2+ to speaker coil "-"
A special two-conductor cable on both ends wired to pins 1+/1-, 2+/2 of NL4FC NL4MP pin+ to speaker coil "+"